SC ASCENS FILIGRAN SRL is one of the best known companies of document security providing in Romania. 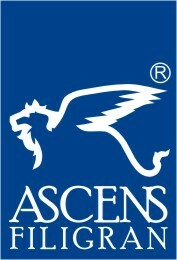 Owing to product quality, delivery promptness and granted warranty, ASCENS FILIGRAN gained as clients more than half of the Public Notary Offices, Judicial Executors, Chambers of Commerce, City Halls, Licensed Translators, Tourism Agencies, Real Estate Agencies, Lawyers, Juridical Counselors, Trading Companies, etc. In the attempt of achieving the West European standards in document security and satisfying the exigencies of its clients, ASCENS FILIGRAN extended its product range. Thus, in 2004 ASCENS FILIGRAN launched the WATERMARK PERSONALIZED PAPER, very used and appreciated in Western countries. In 2005, ASCENS FILIGRAN extended its product range with the PERSONALIZED HOLOGRAMS, providing a high security degree for documents and products.